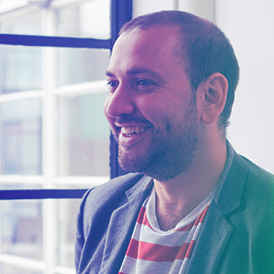 Jason has spent over 17 years working within Design and UX at some of the largest and some of the most respected agencies within the UK. Over these years, he has struggled to know what to call himself. Management consultant, digital strategist, service designer, product manager, interaction designer or user experience consultant. Just some of the labels he has used. Through his work he doesn’t think that the labels matter that much. It’s more about the specific skills you offer. Currently, Jason runs Resonant Design and Innovation, a consultancy that gives his clients more of his time. He is also a Design Partner at Group of Humans — a collective of industry leading peers. He works with partners to help them with their challenges. Building teams. Creating solutions that push the envelope but are actually delivered. Always focusing on achieving value to businesses, employees, and the users or customers they serve. Jason also runs highly in-demand monthly local IxDA London events with his co-leader, Boon Chew. Jason Mesut will share an overview of his work over the past decade developing visual frameworks for design teams, leaders and designers to map their skills and define their future professional development. Through his role as a team leader, and with workshops he runs with the community and his clients, he has seen how valuable it is for designers to self-reflect on who they are, and project the areas in which they feel like they should develop. Whether that’s within, or beyond the context of the organisation in which they work. You'll get to hear a story of vulnerability, anxiety and torment that ultimately led into investing in this area over the last year. Something that many designers across the globe have related to since he shared his first version of the presentation last summer.